Would you be suspicious if someone who doesn’t speak to you suddenly comes by and chats you up for about ten or more minutes? Yeah, me too. And I don’t know where it came from, but after it was over I had an overwhelming urge to say, “May the bird of paradise fly up your nose!” I didn’t. But I thought it. And I also thought that it would probably be most painful if a bird flew up your nose. And if it did happen I’d much rather it is someone else’s nose than mine. There’s a funny thing about birds. They can do all sorts of things. They can tell secrets. When I did something that wasn’t quite on the up and up, some dumb little birdie always told my mom. But that’s to be suspected when they have that bird’s eye view of things going on. And all the while I thought I was free as a bird turned out I was just a sitting duck with some stool pigeon reporting all my moves. I never did figure out who it was. However, after she got over being mad as a wet hen she’d let me fly the coop. As I got older I realized she really was a wise old owl. Check our Our Creative Spaces for all kinds of inspiration! My grandmother always told me she ate like a bird. That is, until I told her that birds eat constantly and sometimes eat up to twice their weight in food, daily. I guess she didn’t want to know that as she gave me the old eagle eye the rest of that day. To prove a point, (I suppose anyway), there weren’t any snacks that day until supper. As my stomach growled, I really felt liked I’d cooked my own goose! Speaking of grandmother, I guess my sister and I weren’t always good little girls at her house. Grandmother insisted on being called Grandmother. She wasn’t a mam or a nanny or even a grandma type person. But one thing she definitely hated was to be called granny. Granny was what they called my great grandmother, my granddaddy’s mother, or her mother-in-law. Now, I can understand. Anyway, my sister and I, sitting naked as jay birds in the bathtub, would call for her when we were ready to get out. I don’t know why we had to wait for her. Seems like she was afraid we’d fall or maybe she wanted to make sure we’d washed with soap. Whatever the reason, we would call out, “Granny, we’re done!” Well, maybe it was just me who’d call out while my sister giggled. There would be no answer. Birds of a feather that we were, we (or I) would try again. 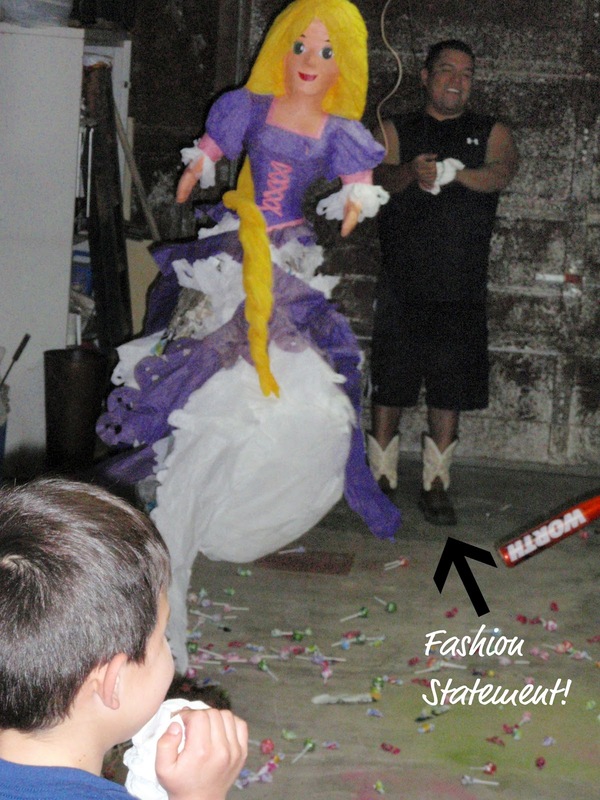 In a voice sweet as a nightingale I’d cry out, “Granny, we’re done!” Nothing. Finally, shriveled and shivering in the cold bathwater, one of us would call, “Grandmother, we’re done!” Quick as that old roadrunner, she’d dash in, grab us up with a towel and all was well. Meep Meep. She was a sly old bird! I may just start saying “may the bird of paradise fly up your nose.” I kind of like the sound of it! I can have a “Pretty Woman” plan in the eaves. You know, I almost peed my pants, Pirates of Penzance. Most people just ask how you’re doing to say something when you pass each other in the hall or on the street. They don’t listen and they most likely really don’t care. So if I answer with “may the bird of paradise fly up your nose”, would they even notice? Probably not, but in case they did and asked what I’d just said, I could say, “hey, I really like your clothes.” Or maybe “you’ve got something on your nose.” Or how about “that’s just the way the day goes,” or “good, except for the run in my hose.” And I can just smile, like the cat that swallowed the canary. Yes, think I’ve got it covered! I’m on the downside of a pretty powerful cold or something. It zapped every bit of energy I had. I didn’t miss work, except for one day, but by the time I got home I didn’t want to do anything. Two full weekends were spent sleeping or just laying around. I didn’t even want to knit. I still have the cough but I feel okay so it’s time to dig out. I did get the shawl sent off. I didn’t have daylight to take a picture of it after the blocking but maybe my sister will send one. I made some more of those cute little hearts but now that I’ve missed Valentines, I guess I’ll just keep them for later. Being the bird brain I am, now I have birds on my mind. I have a stained sweater I saved to make an owl. The plans are in my head so there’s a big chance that the finished product won’t look anything like my mental picture! 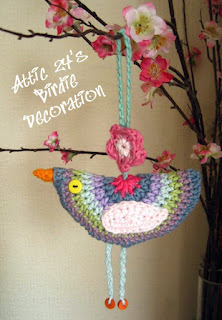 And I ran across this cute little bird pattern, on Attic 24’s blog. I want to make some of them too. Birdie decoration. DIY on Attic 24's blog. Valentine’s day is sweet Belle’s birthday. We went over to help her celebrate. She was in a poofy pink dress and told me I had to call her princess because today was her birthday and she was four. She’s so funny. 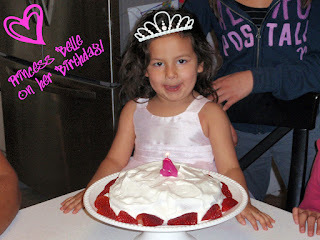 My princess on her birthday. 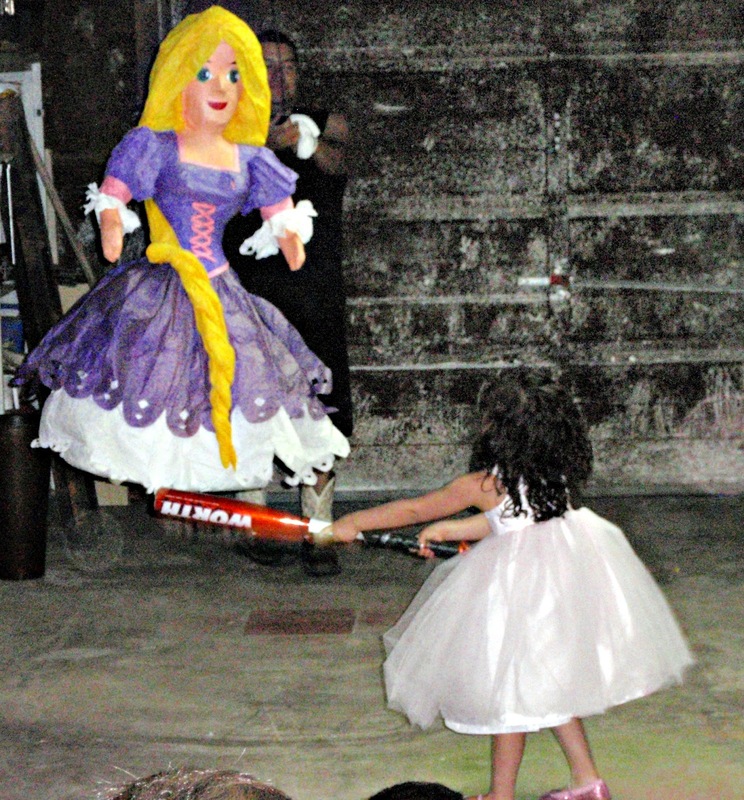 The princess and her pinata. 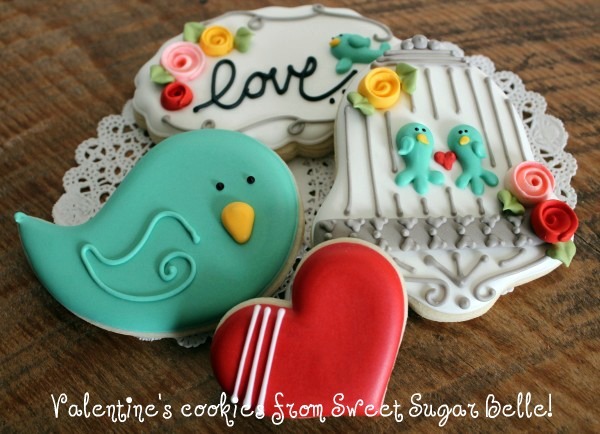 We lucked out and got some Sweet Sugar Belle cookies for Valentines! We even shared with co-workers. Funny, the people I gifted don’t want to eat them. They say they are too pretty! All I can say is the love bird, or bluebird of happiness, your choice, tasted mighty fine to me! Valentine cookies from my daughter, Sweet Sugar Belle. Love it! I think I will steal your saying. And your little Princess Belle is adorable. The story about calling your Grandmother "Granny" is too funny! And I've never heard the saying about the bird of paradise, but it is pretty catchy! It's actually one of those old country songs my Mamaw used to play. Funny and one of those dumb things you remember forever! I remember the song! Always thought it was funny. Princess Belle is so cute & love her pinata. Surely the bird cookie isn't a Bird of Paradise, looks too yummy. I double dare you to say it when you pass someone in the hall. I giggled, grinned, and howled! How can you say mine is better than yours? You wrote a wonderful 'bird scatter-brained' story! I just has a small observation. 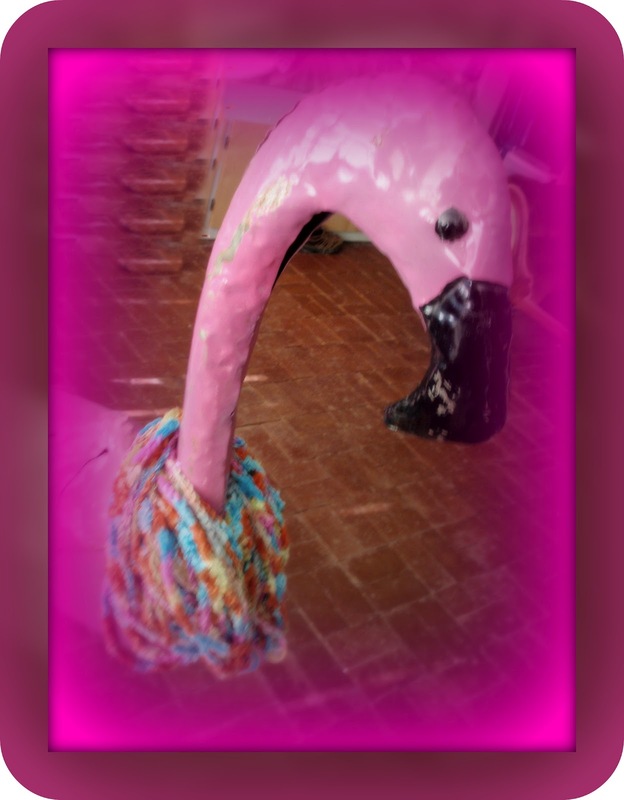 I love the knitting ideas. 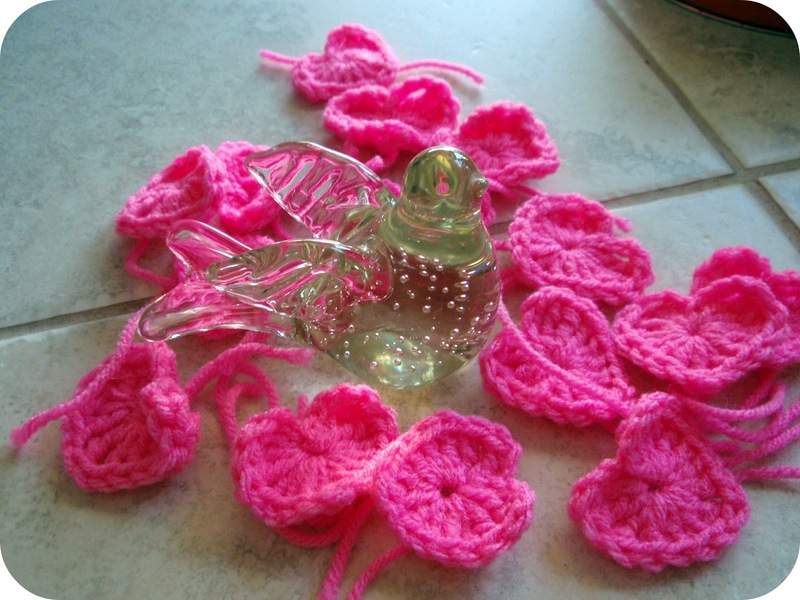 The hearts are quite lovely and the bird - I can do that - well if I ever get 'a'round to-it'. I never did get to that year of knitting... Isn't there another New Year somewhere soon?? One of these days I get so caught up I just won't know what to do and a bird of paradise will fly up my nose! Ahhh--another song on which I grew up! That opening about being chatted up by such person is one reason I put on my track shoes and ran!!! Those moments scare me!